North Korea's drumbeat of missile tests remains steady. After days of anticipation, the country appears to have test-fired a missile from Jagang province shortly before midnight July 28. Leaks to the media the week prior indicated that South Korean and U.S. officials were tracking preparations for a new test. Speculation swirled that it would be timed around July 27, the 64th anniversary of the armistice that ended the Korean War. The U.S. Department of Defense confirmed that it had detected a ballistic missile launch but is still assessing the situation. The Japanese government said the missile flew for around 45 minutes before landing in the Sea of Japan, inside Japan's exclusive economic zone. In response, South Korean President Moon Jae In and Japanese Prime Minister Shinzo Abe convened emergency meetings. Statements and assessments about the test will begin to emerge from the United States, South Korea and Japan in the hours to come. It will be important to monitor early reports evaluating the launch's success, as well as details about the device's range and apogee. But regardless, the new test will lend credence to the United States' calls to take a tougher approach to North Korea. The specific technical requirements of North Korea's weapons program largely dictate the pace and aim of its missile tests. North Korea has been trying to develop a viable heat shield and re-entry vehicle to enable its missile system to deliver a warhead more reliably on target. The latest launch is the country's first since its landmark July 4 test of an apparent Hwasong-14 intercontinental ballistic missile (ICBM), which, according to high-end estimates of its range, would be able to hit areas of the western United States. A contractor-led role in Afghanistan would confirm the narrative that America wants perpetual warfare and to rob the country of its riches. The New York Times reported on July 25, 2017 that U.S. advisors and Afghan officials are trying to use Afghanistan’s mineral wealth potential—once estimated at $1 trillion—to sell President Donald Trump on a war he understandably has little enthusiasm for. This new sales strategy is dangerous as it aims to exploit Trump’s cartoonish views on global intervention, which meld the minds of a medieval emperor and a modern-day businessman. Trump has on several occasions said that the United States should “take the oil” in conflict zones like Iraq. His explications have varied in focus, but “take the oil” appears to rest on two basic principles: what is theirs becomes ours once we invade; and foreign wars should at least pay for themselves, if not become profitable ventures. 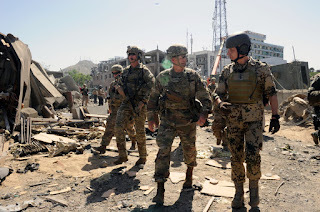 Those who seek a long-term U.S. presence in Afghanistan are now desperate because the president has rejected the war strategy put forward by his bureaucracy and political appointees. According to POLITICO, the National Security Council Principals Committee meeting last week chaired by Trump was a “sh*tshow” that ended with the president sending back the Afghanistan strategy presented to him, further delaying a review that has already been extended twice. Kargil was India’s first living room war where controlled electronic feeds lit up emotion in homes nationwide that fostered a groundswell of jingoism. The nature of war is directly related to the technology of the times and the resources available, but how we can fight and how long we might fight increasingly depends on the willingness of the world as a whole to allow it. War between countries and particularly war between major powers will not be without consequences to the ever increasingly inter-dependent world and hence international pressure to terminate conflicts before they expand and/or spiral out of control is only to be expected, specially when the nations in conflict are armed with nuclear weapons. How many nuclear weapons a country has does not matter, as for the world outside even the use of one will not be without huge collateral consequences. Considering this, this may be a good time and place to ponder over the future nature of war and how this would impact India. China has many advantages over India along the Himalayan frontier. The benefit of inner lines in Xinjiang, Tibet and Yunnan, much more developed and populated frontier regions, PLAAF airbases within easy reach of Indian population and industrial centres, airbases and cantonments give many advantages, particularly in a war that is limited by time and space. India’s advantages are more seaward. Affected with Pakistan sponsored Terrorism, Kashmir valley of India’s Jammu and Kashmir state has witnessed a double number of births annually since Census 2001. Fertility Tables published by Census 2011 indicate that there were 85,157 live births in the Valley in the year preceding Census 2001, that number had risen to 1,76,673 in 2011. “This abrupt rise is restricted only to births in the Valley. In Jammu region, the number of births has increased by only 19.3 per cent, which is somewhat less than the rise in population of that region. In Ladakh number of births has declined by nearly a third,” according to an analysis report released by Chennai based Centre for Policy Studies on Tuesday. The Teesta River Basin is widely known for the Indo-Bangladesh water-sharing dispute and the political tussle between the government of West Bengal and India’s central government on “giving” Teesta water to Bangladesh. However, recent events in the basin have cast light on other issues as well, the biggest being the revival of demand for a separate Gorkhaland. Historically, Darjeeling and the surrounding regions were passed around among the regional powers of Sikkim, the Gorkhas, Bhutan, and the British until 1947, when they became a part of independent India. The British brought tea along with them, and the region, especially Darjeeling, prospered. However, most of the positions of wealth and power were captured by Marwadis and Bengalis respectively, while the local tribes (Lepcha, Limbu etc.) as well as the Nepalis who had migrated to work on the tea estates found themselves on the lower rung of the ladder. With very little in common with the Bengali and Marwadi languages and cultures, it was only a matter of time before the Gorkhas would aspire for a separate state. Had Nawaz Sharif continued as Prime Minister till 2018, he would have created history by becoming the first Prime Minister to have completed a full five-year term in Pakistan’s 70-year history. As it happens, he still created history, though of a different sort. When he resigned on July 28, he became the only thrice elected Prime Minister who had his tenure cut short each time by ‘the empire’, or the deep state in Pakistan. The Panama Papers leaks in April last year consisted of more than 11 million documents, from the law firm Mossack Fonseca, containing confidential attorney-client information dealing mostly with off-shore entities and bank accounts. Of these, eight pertained to Mr. Sharif, his sons Hassan and Hussain and his daughter and political heir Maryam. These revealed four property purchases by the family in London in the 1990s, hardly a secret in Pakistan. Opposition leader, the cricketer-turned-politician Imran Khan, immediately dubbed it ‘Panamagate’ and demanded Mr. Sharif’s resignation. Pakistan’s judiciary has acted once again against a democratically elected government. Major judicial verdicts in Pakistan have not upheld democratic values. Ayub Khan’s coup, which was the first military takeover, had been described as a “revolution” by the judiciary. General Zia-ul-Haq’s takeover was legitimised through the “doctrine of necessity”. Bhutto’s death sentence by the Pakistan Supreme Court, through a 4-3 verdict after two judges had been removed from the original nine-member bench, was considered by many as a judicial murder. When Zia dismissed his protégé Muhammad Khan Junejo, whom he had appointed as prime minister, the Supreme Court upheld the dismissal as unconstitutional only after Zia’s death. But even then it chose not to restore the Junejo government on the intervention of the army chief, as later became apparent through the revelation by General Aslam Beg himself in 1993. General Musharraf’s takeover was justified once again in terms of the doctrine of state necessity. The court decided to ignore the core issue of Article 6 which prohibited coups. In 2012, Yousuf Raza Gillani was dismissed as prime minister on account of a Supreme Court order before he could complete his five-year tenure. In the last seven decades, the office of the prime minister of Pakistan remained abolished for over 30 years during military rule. The general stance of the Pakistan judiciary throughout has been lenient towards the army and tough against civilian governments. The Pakistani military now finds itself in a familiar position—firmly ensconced in the catbird seat. 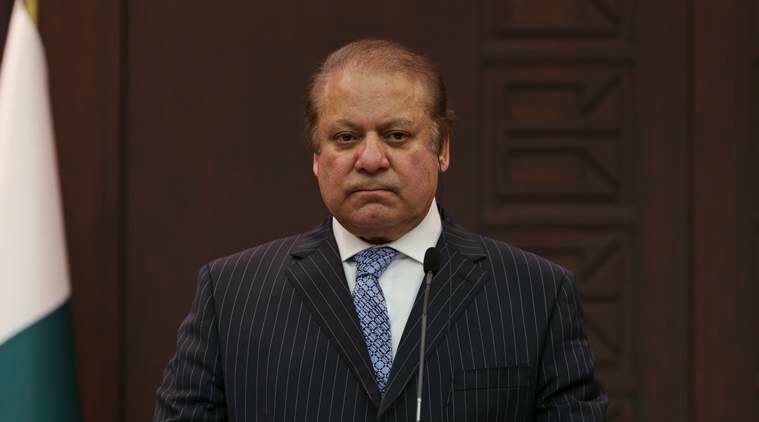 Sharif has served as Pakistani premier two other times, and in both cases, he was forced out prematurely. In 1993, he lost his job after the Pakistani president—a largely ceremonial position today, but a powerful one back then—dissolved Sharif’s government. Six years later, he was overthrown in a military coup. This time around, Sharif was dismissed after a long investigation stemming from revelations in the Panama Papers that Sharif’s children harbored offshore assets. And yet, it’s not the Panama Papers that sent Sharif packing. Rather, the Supreme Court cited Articles 62 and 63 of the Pakistani Constitution—clauses instituted by military dictator Zia ul-Haq in 1985. They stipulate that any lawmaker deemed dishonest or untruthful can be removed from power. In its ruling, the court declared that Sharif had failed to disclose his employment with a Dubai-based company owned by his son when submitting his paperwork to contest the 2013 elections, which propelled him into power for his third term. A general view of Mes Aynak valley, 40 kilometers (25 miles) southwest of Kabul, Afghanistan. The Afghan government is trying to grab President Donald Trump’s attention by dangling its massive, untouched wealth of minerals, including lithium, the silvery metal used in mobile phone and computer batteries considered essential to modern life. There are also deposits of coal, copper and rare earth elements. What does a president who campaigned on an "America First" foreign policy do with the longest war in U.S. history? That is the dilemma for Donald Trump as the White House conducts a policy review of Afghanistan, where U.S. troops have fought for nearly 16 years. With Trump skeptical of committing more troops to what some see as an unwinnable war, one idea has come to the forefront: using Western companies to extract Afghanistan's vast, untapped mineral deposits. How much is there? A 2010 U.S. study estimated more than $1 trillion worth of untapped mineral deposits, but Afghanistan's violence, corruption and poor infrastructure would make mining extremely difficult. BEIJING — China’s president, Xi Jinping, has opened a public campaign to deepen his grip on power in a coming leadership shake-up, using a huge military paradeon Sunday, speeches and propaganda, along with a purge in the past week, to warn officials to back him as the nation’s most powerful leader in two decades. No longer merely against the ropes, the Islamic State is on the canvas. Aftermonths of bloody urban warfare, the Islamic State’s uprooting from Mosul represents the latest and most significant blow in an eighteen-month period of disastrous losses. It seems like only a matter of time before the Islamic State loses its already tenuous grip on the Syrian capital of Raqqa. Yet we have been here before. A decade ago, an earlier iteration of the group had appeared decimated by the efforts of coalition forces and the Sunni Awakening. The difference today is that while the Islamic State is indisputably weaker compared to its 2014–15 boom, it is indisputably stronger than after its 2007–08 bust. Baghdadi was target-killed by the Russian Air Force in late May in Raqqa. Ultimately, the question of whether Baghdadi is indeed dead or not is not the crux issue. The leadership of the Islamic State/Caliphate has endured frequent target-killings and learned to cope with such losses. They established leadership councils and a host of redundancies in senior ranks - all aimed to guarantee continuity even as target-killings continue and escalate. The vast majority of the key commanders currently rising in the Islamic State/Caliphate are veterans of Saddam Hussein’s Intelligence and Armed Forces. Even if a new Caliph is nominated - he will not be the actual leader. The real leaders are the two-man team of Iyad al-Obaidi and Ayad al-Jumaili - both veterans of Saddam’s military. Obaidi has already moved to assume leadership from his bastion in Hawija, Iraq, where he controls the main forces of the Islamic State/Caliphate. 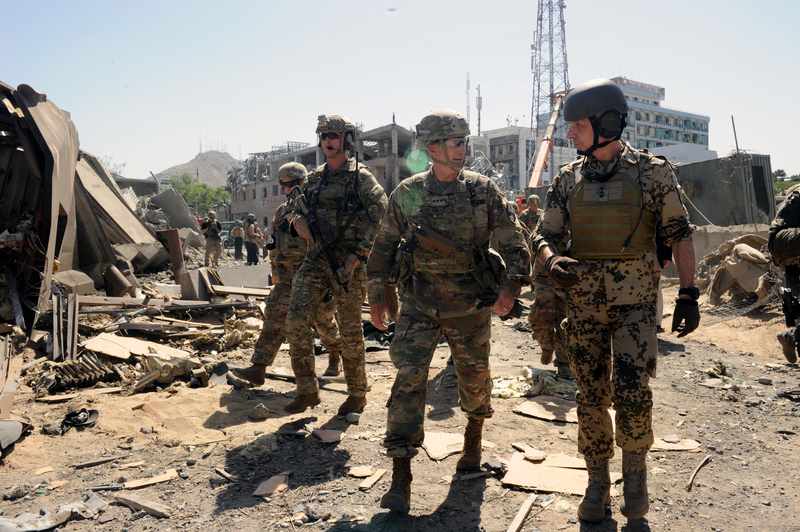 Do Civilian Casualties Cause Counterinsurgents to Fail? The film suggests a simple logic to back this message. A counterinsurgent must win over the “hearts and minds” of the civilian population in order to win the war. We could brush this assertion off as “just Hollywood.” However, one of the most critical influences on counterinsurgency doctrine, U.S. Army Counterinsurgency Field Manual 3-24, holds a similar view. With one crucial caveat, of course. FM 3-24 argues that excessive civilian casualties will cripple counterinsurgency operations, possibly to the point of failure. This is especially the case when the counterinsurgent doesn’t seek popular support by implementing public works projects and rendering other forms of aid, according to the manual. Russian cyberattacks have antagonized, bullied, and supressed neighbors and countered Western influence. 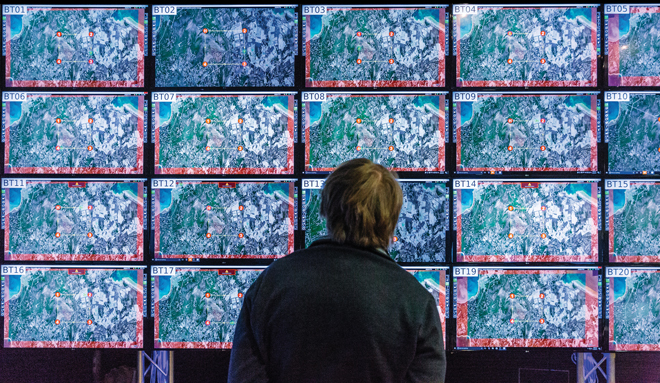 The time has come for NATO to adopt a cyber strategy that incorporates active defense. During the past decade, Russian government cyber actors have pressed the legal and ethical boundaries of cyberspace, testing the limits of what the international community would accept—often finding none. Moscow has pushed to see if there would be a proportional response from its cyber victims, and the answer usually was no, except to repair or limit the damage. If this increased cyber activity and presumed cyber strategy have revealed anything it is this: Russia is emboldened by the lack of international response to its cyber attacks, and it will continue to escalate the sophistication and lethality of this attack vector to antagonize, bully, and suppress Russia’s neighbors and counter Western influence. April 2007 – Estonia: Russian distributed denial of service (DDoS) attacks against government websites as well as the websites of banks, universities, and newspapers in response to the removal of a Soviet war monument in Tallinn.1 This attack is considered the first nation-state cyber attack against another nation-state. In 1957 the Soviet Union launched Sputnik into low earth orbit. It was the planet’s first artificial satellite—and much to the apprehension of the Pentagon and U.S. policymakers, it belonged to the commies. The Space Race had begun and America was losing. Today it seems ridiculous that anyone would try to nuke the moon, but the political and cultural tensions of the 1950s made desperate plans seems sensible. In 1958, the Armour Research Foundation—the precursor to the Illinois Institute of Technology—developed a plan with guidance from the Air Force. Designated Project A119 or “A Study of Lunar Research Flights,” the ARF’s inquiry looked into the possible effects of a nuclear detonation on the lunar surface between 1949 and 1962. Partly, the studies were a response to growing concern over atmospheric effects of nuclear testing—but not merely. 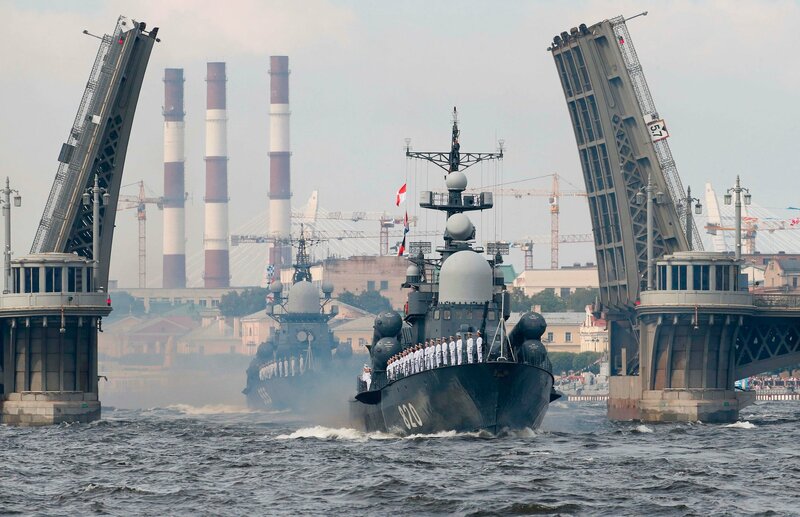 MOSCOW — Russia’s global military ambition was on display Sunday when the country celebrated Navy Day with large military parades not only in St. Petersburg, but also off the coast of Syria. The parades of ships, submarines and aircraft were held at Russian naval bases in Sevastopol, which Russia annexed from Ukraine in 2014, and at Tartus in Syria, where Russia is expanding its military presence. The main parade took place in St. Petersburg, Russia’s second-largest city and home of the navy’s headquarters. Russian sailors standing on the deck of a small rocket ship during the the naval parade in St. Petersburg, along the Neva River. 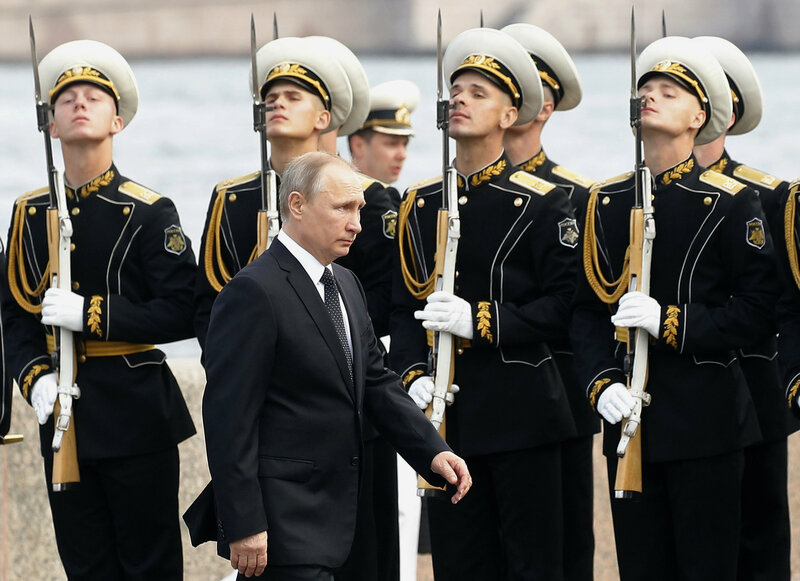 Aboard his presidential cutter, Russia’s leader, Vladimir V. Putin, greeted crews of five ships and a submarine lined up for him on St. Petersburg’s Neva River. Thousands of viewers filled the city’s granite embankments. Later, Mr. Putin disembarked onto the Admiralty Embankment to deliver a speech from a tribune. It is not unusual for disrupting technologies to be embraced and feared—and not necessarily in that order. That was and will continue to be true for all technologies that bring both benefit and risk; it is a duality in which many technologies have to exist. Examples throughout history have been the airplane, the automobile, unmanned weapons systems, and now even software – especially the software which powers artificial intelligence (AI). Last week at a U.S. governors’ conference, Elon Musk, the CEO of the engineering companies SpaceX and Tesla, reportedly told the assembled politicians that “AI is a fundamental existential risk for human civilization,” sounding the alarm bell. This is not the first time Musk has expressed this concern, he’s done so as early as 2014. Many have branded him a Cassandra, and if he is, he’s not a lone-wolf Cassandra; he’s joined in those views by the likes of Stephen Hawking, Bill Gates, and other experts. It is not surprising there is an equal number of experts who question Musk’s concern and believe his alarm bell is tolling for a non-existent threat. I am not an expert in AI, nor am I an AI practitioner; I’m more of a national security and intelligence philosopher. Therefore, I am not sure I want to debate a man who is one of the foremost entrepreneurs and risk-takers of his time. That said, it may prove useful to unpack the issues a bit and also discuss what we find in the context of AI’s use in defense of the nation. Retired US Navy Rear-Admiral Mike Brown has spent a lot of time grappling with Cyber as the fifth domain of warfare, and as a pioneer in developing only operational capability and helping to define doctrine. Cyber warfare is less conventionally understood than the first four domains of Land, Sea, Air and Space. Outside of military, intelligence and specialist government services, it is only very recently that the mainstream has grasped cyber as a powerful instrument of war. These days Mr Brown is vice-president and general manager for security specialist RSA’s Global Public Sector Business. It’s a role he is suited to. But on retiring from the military, he spend time in the US federal government, first with the Department of Defence and then with the Department of Homeland Security in the post 9/11 years focused on cyber security issues. His last active role inside the US Government was as Director of CyberSecurity Coordination for DHS. Mr Brown’s background gives him an excellent vantage point to view global cyber trends. Electronic warfare joins the digital realm in a confluence of activities to adjust to evolving threats. The U.S. Army is consolidating major electronics disciplines in an approach that brings education and operations under a single umbrella. This confluence extends to physical plants as well as organizational charts. For example, the Cyber Center of Excellence at Fort Gordon, Georgia, is co-located with its operational counterpart to meld the identities of theory and practice. The key to success is adjusting to the ever-changing threat, the general declares. Over the next 10 years, Fort Gordon will transform completely with state-of-the-art facilities to support the training of cyber, electronic warfare (EW) and signal professionals, he continues. “It’s not just building the new Army Cyber Command complex, [but] it is also building all the facilities on the institutional side that allows us to train the world’s best operators,” he states. Dominik Pudo and Jake Galuga contend that after decades of research and ‘rescoping,’ high energy laser (HEL) weapons are making their irreversible transition onto the battlefield. To provide an insight into how this has happened and what it might mean, Pudo and Galuga here examine 1) how a shift away from the strategic use of HELs and towards their tactical application could allow for the exploration of this technology at a fraction of past costs; 2) the advantages and disadvantages of using HELs in military operations, and more. What's the difference between cyber and IT? This is part three of a series exploring the differences between military cyber forces, capabilities, mission sets and needs. For previous installments, see part one and part two. The delineation between “cyber” and “IT” is generally thought to be operations within a maneuver space vs. the infrastructure that enables that to happen, respectively. Moreover, Col. Brian Lyttle, program executive officer for cyber at the Defense Information Systems Agency, referred C4ISRNET to the joint publication that governs cyber regarding the delineation between cyber operations and IT/cybersecurity. Speaking after his participation in a recent panel discussion, he noted that the document divides this up into three specific areas: offensive cyber, defensive cyber and network operations, which is where most people would think IT rests, he said. “We’re getting a little bit confused on infrastructure versus buying a network weapon for the [cyber protection teams] to use. And we have to make sure we understand when we’re weaponizing the network to do [defensive cyber operations] or [offensive cyber operations] versus maintaining the” network, said Gary Wang, deputy CIO of the Army at the time, now acting, last May. “I mean, it’s the only place where you’re going to run your business [operations] and you’re also going to fight a cyber war on the same infrastructure simultaneously.